Trollface and his friends are unable to live even a day without new crazy adventures! Today they decided to shoot themselves with a big cannon. Help them to become real cannonballs and reach the destinations in each of the levels? 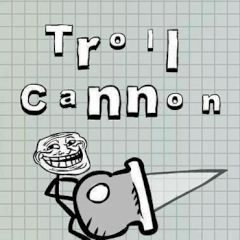 Meet Trollface in this amazing shooting game! Here Trollface is playing the role of a cannonball. Shoot him with a cannon and make him fly in a certain direction to get to the destinations in all of the levels. Are you ready to check your accuracy and logical thinking in this funny arcade? Then we don't disturb you anymore – start playing this game developed by the developer under the proud name Bored right now.